7 nights, 5 days of riding, one touring day. Trek to the Beach takes you from our mountain farm, through a variety of different ecosystems all the way to the beach. Each days riding is different from the last. The trip includes, hiking in the La Cangreja Rain Forest National Park, a tour of an authentic chocolate farm, and a Canopy Zip Line at Sky Mountain. Our progressive multi-day trek brings you into the heart of rural Costa Rican culture where you will experience the lives of the “Ticos” up close in a way that most tourists never get to see. Day 1: You will be met at the Juan Santamaria International airport (SJO) and drive for one hour to Santiago de Puriscal nestled in the mountains above the bustling central valley of San Jose where you will begin your adventure at the Establo San Rafael Bed and Breakfast adjecent to the Barking Horse Farm. Day 2: This is the first day of the trek. Leaving the farm in the morning we travel through farmland with beautiful views of the lush green valleys and mountains. to the village of Polka, where we will spend the night with a rural farming family. You will have the opportunity to experience true Costa Rican hospitality. Our bilingual guides will be present to facilitate a rich cultural exchange. Day 3: In the morning we start out early heading towards the rain forest of Mastatal. The terrain is rugged, ascending and descending through the steep mountains, crossing rivers and passing cascades and small waterfalls along the way. We will have the opportunity to stop and swim in the clear fresh waters of the larger rivers. We have lunch with Doña Teresa and Doña Ana, Huetar indigenous women who live at the top of the mountain. 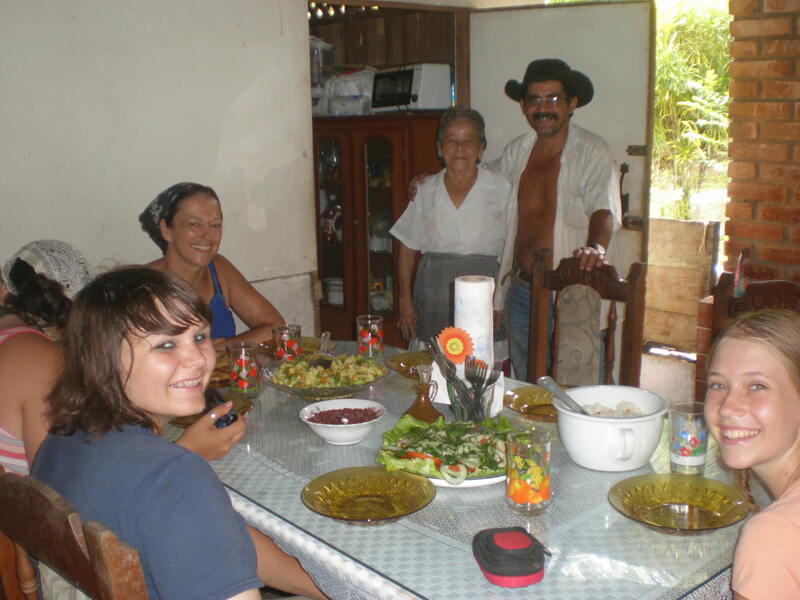 They will invite you into their humble home and treat you to a simple lunch cooked on their wood stove. 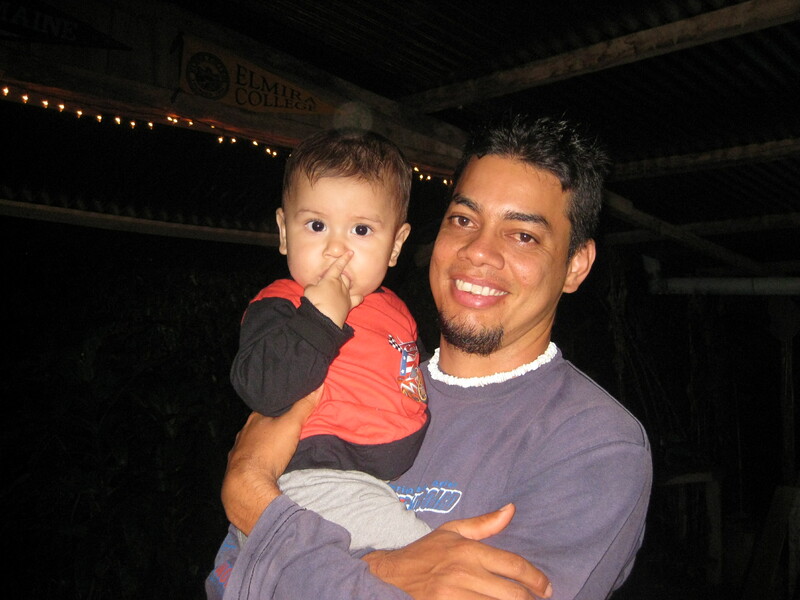 Javier, the owner of Villas Mastatal, and his son Andres. After a long day of riding, we arrive at the Ecologically Sustainable farm of Villas Mastatal, owned and operated by Javier and Raquel, a young Costa Rican couple. They host volunteers from around the world interested in learning about sustainability. We will be lodged in the rustic setting of the bunk house overlooking the pasture where the horses will be spending the next two nights. A day of rest for the horses and a day of fun for us. Here in the last virgin of Puriscal County we can discover the beauty of the La Cangreja National Park. Take a guided hike through 500 acres of unspoiled jungle, along the well-groomed trails, past towering trees, lush jungle and rushing rivers. 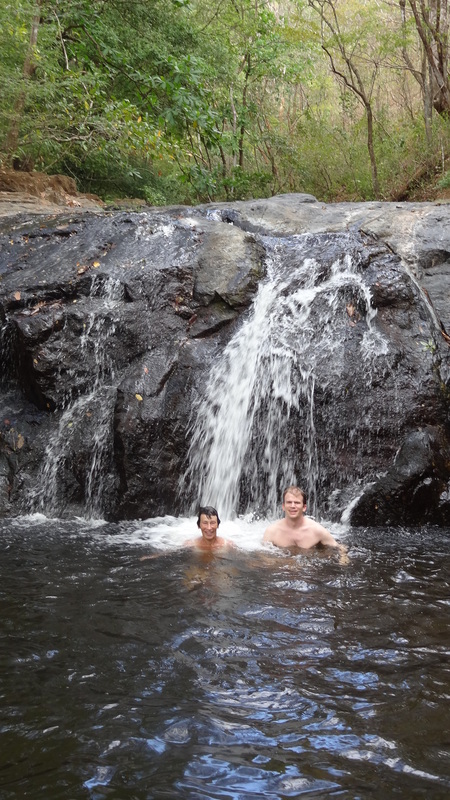 Swim under a lovely waterfall deep in the rainforest. After lunch we will visit Iguana Chocolate, a family run chocolate farm. Take part in the making of chocolate from harvesting the cocoa pods to making your own truffle. Don’t forget to take some samples along to nibble on during the ride! Today we will arrive at the beach. But first we must travel through the coastal plain on trails through private farms and under the shade of palm tree and banana plantations. We will be spending the night at Pozza del Pacifico at Playa Bandera. Relax in the plantation style guest home with the biggest swimming pool and water slide in the region. 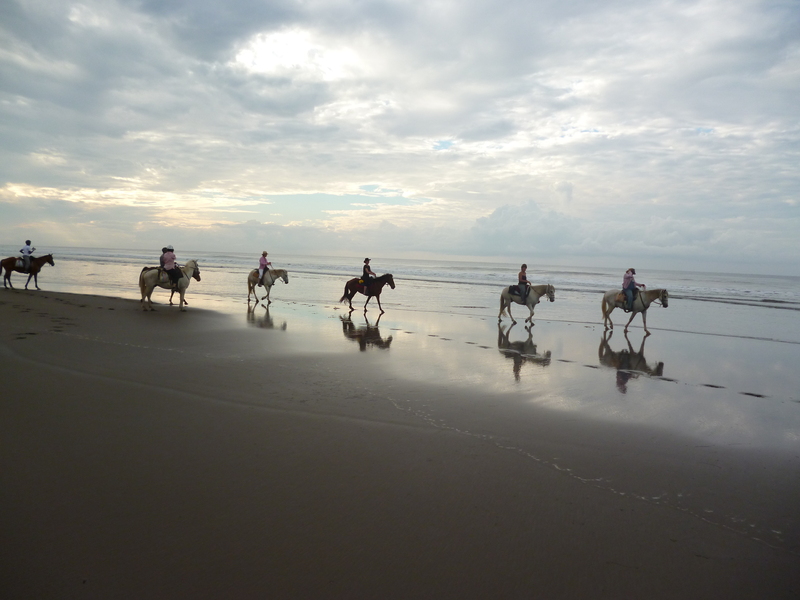 Peaceful beach riding but with the chance to gallop if you wish. Our horses love the water! The beach we will ride on is virtually untouched. It has maintained it’s natural environment and we often see flocks of scarlet macaws in the trees that line the shore and formations of pelicans flying over head. Riding at low tide the beach is wide and long with lots of room to move if you want to trot and canter. For lunch we stop at a oceanfront home for a fresh fish lunch. 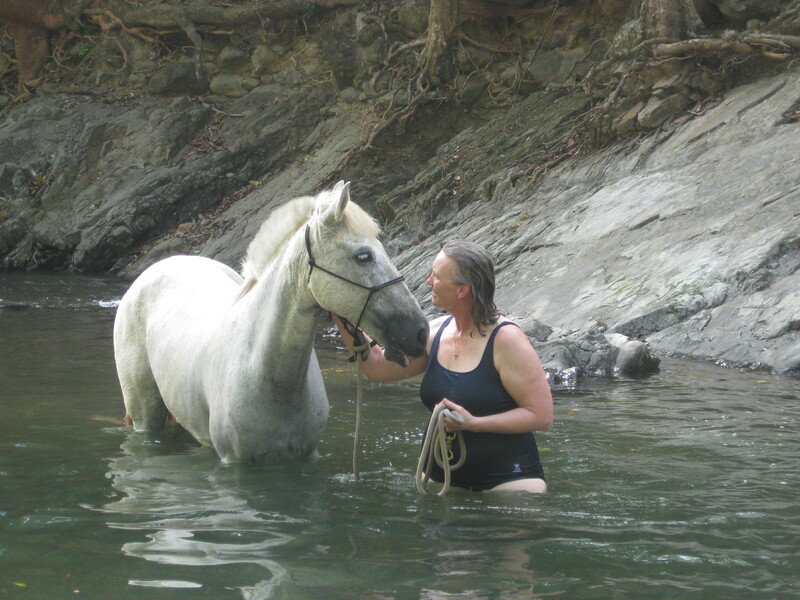 This is a great spot to swim with your horse in the warm waters of the Costa Rican Pacific Ocean. 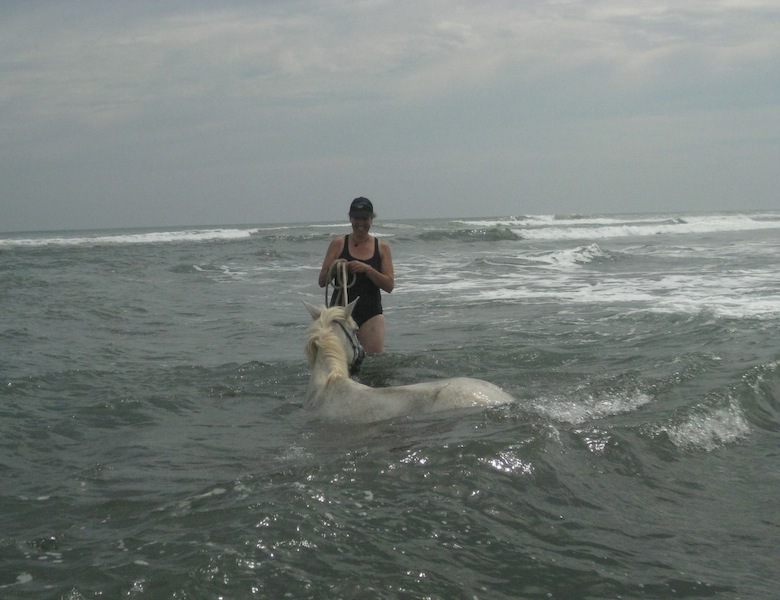 Our horses love the water and will often roll and play in the surf like children. After lunch you can relax and enjoy some well deserved luxury at the ocean front Delfin resort hotel. This is also when we will say good by to the horses, they will go home from here. Day 8: You are welcome to book additional nights at the Delfin, continue your Costa Rican adventure visiting other areas of interest, or take a shuttle to SJO international airport which is about 2 hours away. The hotel staff will assist you in making your travel plans. If you would like to schedule this trek, we are currently scheduling for February through March, 2018. Let us know your convenient dates and we will book it! The price includes airport pickup, all meals and lodging while on the trek (except for two dinners at the beach) horses, tack and bilingual guides.